All that the Brics nations — Brazil, Russia, India, China and South Africa — really have in common is that they aren’t quite yet developed economies while calling them developing nations no longer does them justice. They have repeatedly found it difficult to make common cause. Witness their inability to come up with an agreed candidate for the presidency of the World Bank, or the managing directorship of the International Monetary Fund last year, come to that. On big issues like climate change, where the quintet could assert global leadership, they have been even more divided. All the old divisions were on view at their summit in New Delhi this week, as was one of the main underlying causes of them. While the five nations agreed to study the feasibility of creating a Brics multilateral agency to fund infrastructure and core sector projects — a sort of mash-up of the World Bank, the regional development banks and the IMF, but their own — and to make it a tad easier to settle bilateral trade between Brics nations in local currencies, both decisions fell short of the progress in institution building that had been hoped for ahead of the meeting. The reason is that Brazil, Russia, India and South Africa are all rivals of China in various ways. Each has their economic and geopolitical interests that don’t necessarily align with those of the others. All are competing for investment and trade, not just with each other but with developed and developing countries. All are seeking a sphere of influence and a place at the global high table. China’s is the common shadow they see falling over their efforts. Hence the wary progress in Delhi, beyond the easy sweeping joint statements of concern at global imbalances and criticisms of loose monetary policy in developed economics. Brazil, Russia, India and South Africa fear the clout that China would have in a Brics Bank and a growing trading block, however informal, in which the yuan would be trending towards being its single currency to the exclusion of the dollar. So none is rushing to bring any of that any closer. As long as those sorts of fears persist, the Brics, as a group, will have little influence on world affairs, regardless of the members’ individual economic clout. so… is the holding back from the rest of the BRIC helping China? I don’t think so. Perhaps initially it might look so. In a global environment, working as a team is a matter of survival. When team does not work for fear of one team member, the team would collapsed eventually. What would that mean to the “strongest member” and the rest of the team members? There is a lot to learn for China in a global environment. We would agree that working as a team is more effective than working as individual nations. Yet a team has to have a common purpose. Beyond the rather abstract goal of ‘giving developing nations a bigger scale’, there does not seem to be a goal behind which the Brics find themselves able to unite. — CB. As a European, I know there are many critics over how EU is being managed, how euro was created out of sentiment rather than practicality etc. Some of the criticism are correct. In fact sometime many are correct depends on where, when, how, why. Yet, I think the fact that EU started off with just 3 tiny nations and after the war has a different needs than the BRICS. Also proximity of the nations, all same locations joined together like patchwork, that is why it is working better. 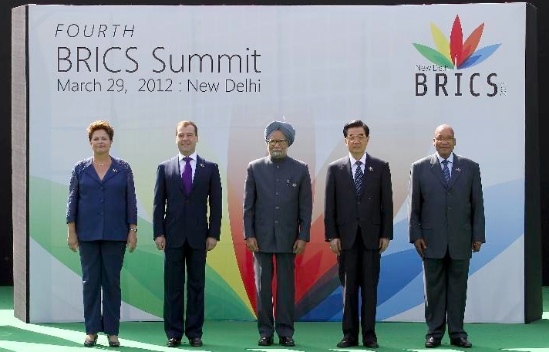 I still wonder why the BRICS think they should have some kind of cooperation? Would it not be better to work with nations around their own region? There is ASEAN, African union etc. ?